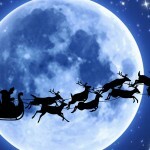 How does Santa get all the way around the world in just one night? 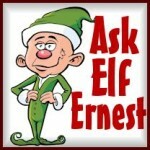 This is the most common question we get here at the North Pole. People will ask us this question before they even ask us our names. Even Santa calls it The Big Question. First of all, I’m going to tell you to read what Elf Ed Zachary has to say on this subject in his classic article, How Santa Does It. Now, that article is kind of technical. 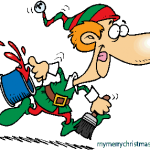 And Elf Ed Zachary, who is famous for defending Santa, can be a bit of a wise guy. So you’ve been warned. And I’ll try to answer your question here in short, simple terms. Santa uses a lot of science. It is not magic. First, I would tell you to open your eyes. 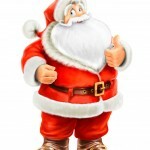 Look at the tracking map at TrackingSanta.net. It shows you when Santa is in every place on Christmas Eve. You hear the reports on Kringle Radio and you read the Santa updates. This is all proof that Santa does it. He is seen all over the world. To get it done, especially if you listen to the news on Christmas eve tracking Santa, it is clear he has a lot of help. There are elves all over the world. He uses a lot of reindeer. And his sleigh is pretty doggone fast. Technically, because of changing time zones and such, it isn’t done in just one night. Santa’s total flight time is about 30 hours. Still, that’s pretty darn fast when you consider how many chimneys he has to get into and how many presents he has to deliver. Read the technical details but don’t forget to ask around with your friends. See how many of them got a visit from Santa. Then don’t worry about how Santa does it. Whenever I ask him how he does it Santa always says, “Cookie power!”. The love inside the cookies makes him go super fast. That Santa can be so silly sometimes.